Animonda Milkies are a food supplement for adult cats. Milkies can be given as a snack, a topping over food or added to drinking water. 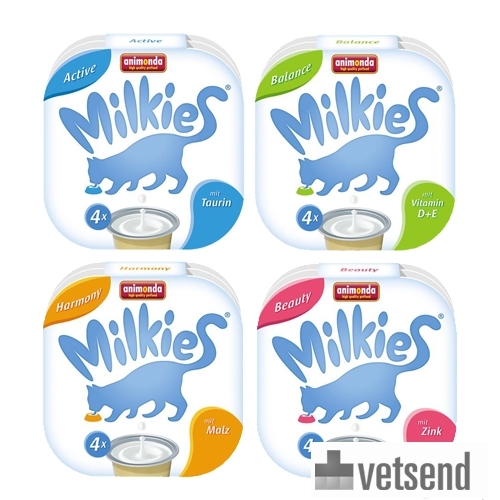 Animonda Milkies are a food supplement for adult cats. Milkies can be given as a snack, a topping over food or added to drinking water. Milkies from Animonda are easily digestible and low in gluten. These snacks contain no added flavourings, colourings or preservatives. For every 3 to 5 kg of body weight, give 1 to 3 cups per day. 4 or 20 cups per pack (15 grams per cup). To try all four, choose the mixed flavour pack (value pack containing 20 portions). Active: milk, dairy products, cereals (0.1% malt) and fruit (0.1%). Balance: milk, dairy products and green tea (1%). Harmony: milk, dairy products, cereals (0.1% malt) and fruit (0.1%). Beauty: milk, dairy products and fruit (0.1%). Analytical information: 6% protein, 7.5% fat, 0.2% crude fibre, crude ash 1.5% and moisture 76%. Have you used Animonda Milkies before? Let us know what you think about this product. We have recently had problems obtaining the cat milk of our usual choice but thsee new flavours have gone down well, so far.